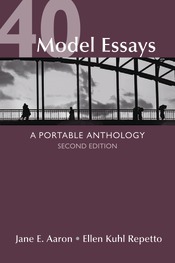 At about half the price of other rhetorically arranged readers, 40 Model Essays: A Portable Anthology combines concise but thorough instruction in the methods of development with a well-chosen selection of classic and contemporary model readings for writers. The second edition features a fresh mix of new and current selections to complement class-proven favorites; new advice on forming a thesis statement; and a wealth of captivating new writing topics. This volume in the popular Bedford/St. Martin's series of Portable Anthologies and Guides offers a trademark combination of high quality and great value. "A handy, well-stocked reader that provides helpful guidance for student writers."